We hope you'll join us for Sunday morning services – a nursery and preschool are provided. Click below to view our monthly newsletters. 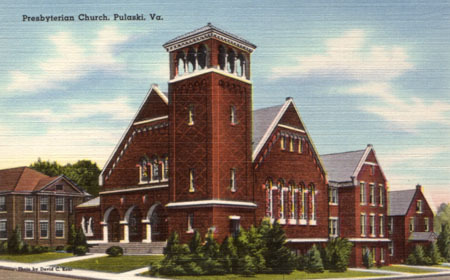 The history of First Presbyterian Church in Pulaski, Va. can be traced to 1881 to a small town called Martin's Station. At that time, Martin's Presbyterian Church was started with a minister, two elders and fourteen communicants. Both the small town and the Presbyterian congregation grew, and in 1892 the First Presbyterian Church building was constructed on the Southwest corner of Jefferson Avenue and 1st Street South on a lot donated by Mr. & Mrs. L.S. Calfee. By then, the burgeoning town had become known as Pulaski. In September of 1912, the First Presbyterian Church acquired 5 lots on Jefferson Avenue and 4th Street North in the town of Pulaski. Trustees of the church at that time were John W. Eckman, B.F. Baldwin, W.H. Bramblett, F.L. Campbell, A.B. Hunt, G.G. Painter and M.W. Stevens. In 1924, the cornerstone of the new church was laid and the first pastor of the new church was Reverend Robert King. Today, First Presbyterian Church is still housed in the beautiful Romanesque style church from 1924, and is listed as part of Pulaski's historic residential district on the National Register of Historic Places. The historic assets of the church include a vintage set of chimes that were recently restored. Enjoying a rich heritage of over 100 years of faithful ministry to Jesus Christ, members of First Presbyterian Church have contributed strongly to the history and vitality of Pulaski and look forward to the opportunities of the future with confidence.